Although the PokerStars NAPT Mohegan Sun Main Event saw its attendance nearly cut in half from their Season 1 total of 719 players, amongst the 387 players that did make to the trip for the first official stop on Season 2 of the NAPT are some of the best poker players in the world, including last year’s winner Vanessa Selbst who ended the day with over 87k chips. Due to the smaller field, tournament officials made the decision to end the tournament after 8 levels of play –Day 1 of the tournament was scheduled to last 10 levels—and Day 2 has also been reduced to just 8 levels. Three-time WPT Champion and 2001 WSOP Main Event winner Carlos Mortensen is just outside the Top 10 with 107,000 chips, along with John D’Agostino, Nenad Medic, and Dan Shak, all of whom are sporting stacks of 100k+. 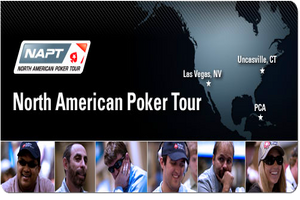 Other big names still in the hunt include Lee Markholt, Bernard Lee, Eric Froehlich, James Carroll, Olivier Busquet, Faraz Jaka, Nick Binger, Pat Pezzin, Matt Matros, George Lind III, Todd Terry, Cliff Josephy, Jason Mercier, Andrew Brokos, Jeff Madsen, Jonathan Duhamel, Joe Cada, and Matt Glantz. This entry was posted on Sunday, April 10th, 2011 at 12:57 pm and is filed under Poker News. You can follow any responses to this entry through the RSS 2.0 feed. You can leave a response, or trackback from your own site.